Three high-end eateries we’ve worked with have finished in the top seven of a best restaurant poll. In an exclusive ‘Teesside’s Best Restaurants’ survey 2017, among Tees Business magazine readers, Muse on Yarm High Street took the number one spot. The Bay Horse, Hurworth came a close second and Cena Italian Trattoria, also in Yarm, was placed a respectable seventh. Hard work and dedication has seen Plum Jam Restaurants – owners of Muse, Cena and The Bay Horse - build an excellent reputation for fine cuisine across all of their restaurants. We are delighted to have worked with the group to create the best use of space and right ambience to enable people to feel relaxed and fully enjoy their restaurant experience. Our interior design team has helped a popular West Yorkshire hotel, with panoramic views of the Calder Valley, to undergo a major upgrade. The New Hobbit Country Inn, set in the heart of Bronte country near Sowerby Bridge, Halifax, has been transformed into a boutique hotel and special events venue following extensive renovation works which include a two-storey extension, doubling the number of guest rooms. Our aim was to create warm, cosy and relaxing guest rooms to reflect the arts and crafts style of the rest of the hotel, and which complement the original Yorkshire stone building and stunning countryside setting. Each of the custom-finished en-suite bathrooms have also been given the design treatment, with contemporary sanitary ware, clean lines and white metro-style tiling. We're delighted to announce the appointment of Rebecca Hayman, 25, from Darlington, who has joined Naru and Ross Architects as an interior design assistant. Having gained a first class BA Honours Degree in Interior Design with the University of Teesside, followed by a period working in industry, Rebecca’s priorities are to support the success of our company’s commercial projects. As well as interior consultations, styling and providing advice on the latest design trends, Rebecca’s responsibilities include creating moodboards and sourcing samples to consolidate ideas; sourcing furniture and cabinetry and researching interior finishes such as wall coverings, flooring, lighting, soft furnishings, sanitaryware and decorative accessories. An award-winning County Durham gastro pub has been re-launched, following a major transformation. Working within the constraints of a Grade II listed building, owners of The Bay Horse, Hurworth enlisted the help of Naru and Ross to reconfigure the layout and secure the necessary planning approval for the changes. The brief included increasing the seating capacity and developing an interior finish more in keeping with sister restaurants: Muse Continental Cafe and Cena Trattoria in Yarm. 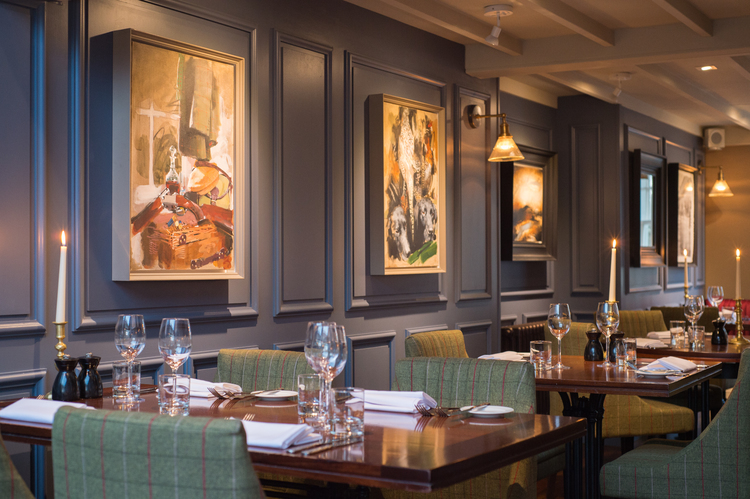 Finishing touches, including soft lighting, old English style panelling in muted colours, handcrafted tables and upholstered seating in velvets and plaids, help to create a more ambient atmosphere throughout. As a result of the refurbishment, the new design features a light-filled conservatory style extension in the heart of the eating area, creating a brighter feel, with views of the walled garden. In addition, a larger separate bar area has been created for restaurant guests, or to be used as a venue in its own right. A new build Roman Catholic church, designed by Naru and Ross and which will benefit the parish of St Therese of Lisieux, Ingleby Barwick in Stockton on Tees, has been completed. The 250-seater church includes a bright area for worship and space for parish celebrations, plus areas for meetings and children's liturgy. The brick, stone and slate design incorporates a large number of windows, providing a light-filled interior. Stained glass panels, created by acclaimed artist Alfred Fisher MBE, who has designed windows for Buckingham Palace and Westminster Abbey, are also featured. The panels, which date from the 1960s, were reclaimed from the site of St John of Gods Chapel during the hotel and golf course development project at Rockliffe Hall near Darlington. Having used some of the panels as a backdrop to the hotel spa, the remaining panels were donated to the Diocese of Middlesbrough to be incorporated into the new church. The church will host an ‘official’ opening ceremony, where the Bishop of Middlesbrough will dedicate the church to St Therese of Lisieux, later in the year. A unique £6.5m rail-served steel store, designed by Naru and Ross on behalf of multi-modal distribution company AV Dawson in conjunction with TATA Steel, has been crowned Northern Winner in the Local Authority Building Control (LABC) Building Excellence Awards. Located on a former brownfield site which had been vacant for 50 years, the 102,000 sq ft warehouse at AV Dawson’s Riverside Park site in Middlesbrough supports the needs of the North East’s Steel and Automotive industries. Rather than focusing on aesthetics, the LABC Building Awards recognise technical innovation, sustainability, high performance and creative solutions. Judges named the steel store winner of the ‘Best Large Commercial Building’ thanks to factors such as its heat and humidity controlled environment, intelligent lighting and the high level of sensitivity to the local environment. The store will enable more than 270,000 tonnes of steel a year to arrive by rail from TATA Steel in Port Talbot, South Wales, before eventually heading by road to Sunderland-based car giant Nissan on the back of AV Dawson’s specialist trailers. As winner in the Best Large Commercial Building category, the design for state of the art building will progress to the LABC Grand Finals which are being held in London later this year. Historic stained glass, executed by a talented master craftsman who has designed windows for Buckingham Palace and Westminster Abbey, are to be reinstated into one of our current projects. St Therese Lisieux Church in Ingleby Barwick, which is currently under construction, will feature a number of glass panels created by esteemed artist Alfred Fisher MBE. Once chief designer for Whitefriars of London, Fisher built his reputation through a stained glass technique called ‘Dalle de Verre,’ derived from the French for ‘glass slab’. The art form relies on dalles being broken or cut into pieces and set into an epoxy base. The glass panels, which date from the 1960s, were reclaimed from the site of St John of Gods Chapel during the hotel and golf course development project at Rockliffe Hall near Darlington. Having used some of the panels as a backdrop to the hotel spa, Rockliffe Hall has donated the remaining panels to the Diocese of Middlesbrough to be incorporated into the new build church at Ingleby Barwick. Construction work on the new church began in May 2015 and is due for completion in 2016.